Where to purchase a roofing nail gun in china or in the world? Zhejiang Rongpeng Air Tools Co., LTD is a vertically integrated professional and porformance roofing nail gun manufacturer in the world. We provide Design, Development, Sales and service to all our customers. With our main focus in Industrial Air Nailing and Stapling tools, High Level Paint Spray Guns and Professional Grade Assembly Air Tools. With more than 22 years of hard work from our management team and dedicated staff, our company has reached the highest standard in Manufacturing, Exporting, Scientific and Technological Development of several grades of air tools from standard level, mid level as well as high level tools in China. 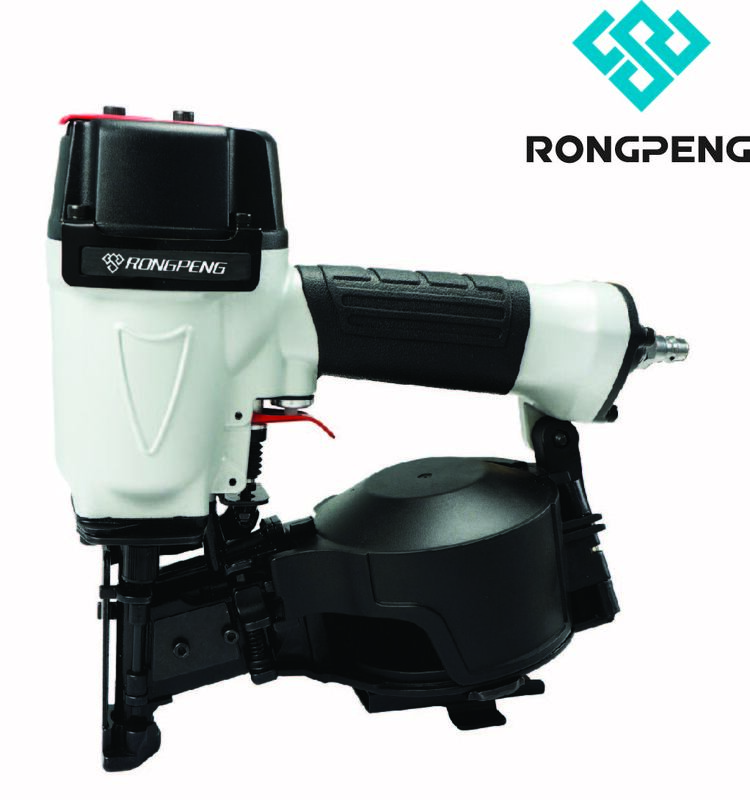 Rongpeng has the one step purchase for all type of nailer , the rongpeng's roofing nail gun is very popular sales in the US nd EURO and so on, the roofing nail gun drives nail 19mm (3/4”) to 45mm (1-3/4”), If feature a die-cast aluminum housing and a comfortablehandle for optimal control and comfort, even during extended use.It is well balanced for stability, and ergonomically designed with a longer handle for ease of operation. It also features a hardened driver blade for longerlife, and economical air consumption with low noise. This air powered nailer is specifically designed for professional work. For asphalt and fiberglass shingle nailing,for both new roofs and reroofing. • Heat treated aluminum Housing -extra heavy duty industrial design. • Comfortable over-molded rubber grip. • Single-action side-load high-capacity magazine that holds up to 120 coil nails and reduces downtime. • Dual carbide inserts for durability. • The tool drives 3/4-Inch to 1-3/4-Inch Coil Roofing Nails. 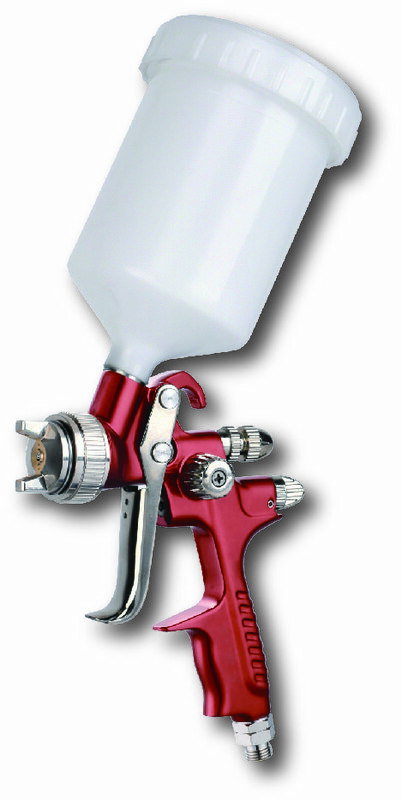 Automotive refinishing spray gun advanced atomization technology for fine finishing applications! How to use a Rongpeng brand pneumatic impact wrench? Technavio’s market research analysts have predicted that the protective coatings market will witness considerable growth during the period 2018-2022. Considering the sales of protective coatings in several end-user industries including infrastructure and construction, oil and gas, automotive, aerospace, and other end-user industries, our analysts have estimated that this market will register a CAGR of more than 9% by 2022. Technavio’s analysts have identified the increase in construction and infrastructure development activities to be one of the major factors to drive the growth of the market. Governments of the emerging economies such as India, China, Australia, Indonesia, and Vietnam are highly investing in infrastructure and residential projects. This has significantly contributed to the increase in construction activities in these regions. Due to the economic recovery and increased spending of the government on infrastructure and residential construction activities, the construction activities in Vietnam are increasing. This will propel the demand for protective coatings during the forecast period. The world-wide used Airless machine which used for the construction paint are Graco Wanger .Which can compete with them in china is RONGPENG .According to the technavio’s report ,the demand of the protective coating will growth in the following 2018-2022.The demand of the airless machines will growth at the same time .It’s coming a bomb increase demand of the airless machines . More than 1200 dedicated employees. How to insert the filter into the spray gun body? 2. Screw the cup onto the top of the body. 3. Install the barbed hose fitting into the base of the gun handle and tighten in place with the lock nut. 4. Secure the air hose to the barbed fitting with a hose clamp. 1.The atomizing cap needs to be adjusted for horizontal or vertical spraying patterns. Spraying in the wrong direction may lead to material build up on the atomizing cap horn. Many performance problems are caused by clogged atomizing holes on the atomizing cap horns (see Cleaning). 2.Rotating the pattern adjustment control in will give you a range between the two patterns in Figure 8. Incomplete cleaning could cause function failures and a degradation of the fan form. Proper cleaning is the best way to ensure trouble free performance from your spray gun. If your gun is not thoroughly cleaned, damage and poor spraying will result. Problems caused by improper cleaning will not be covered by the warranty. Clean the spray gun immediately after each use. 1. Spray a small amount of solvent through the spray gun. Note: Check with local laws regarding this practice. If you are spraying on a regular basis, spraying solvents into the air may be illegal. A cabinet style spray gun cleaner may be required. 2. Disconnect the gun from the compressed air! 4. Disassemble the gun by unscrewing the fluid control knob, removing the spring and needle. 5. 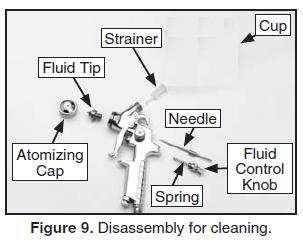 Unscrew the atomizing cap with your fingers and the fluid tip with the service wrench. 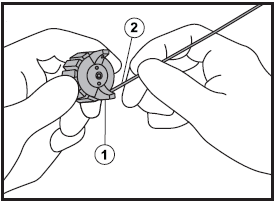 The fully disassembled gun should look like Figure 9. 6. Rinse these parts thoroughly in solvent then dry with compressed air or let air dry. Note: If the small holes in the atomizing cap become blocked, soak in clean solvent. If the blockage still exists, clear the blockage with a small needle, taking great care to not enlarge or damage the hole. Damage to the hole will create a disrupted spray pattern. 7. Use the cleaning brush with solvent to clean the inner orifice and other hard to reach areas on the outside of the spray gun body. 8. Wipe the rest of the gun body with a shop towel and dry. Ø Clean the inside and outside of the spray gun(1)with a brush(2). Ø Clean the inside of the paint cup (1). 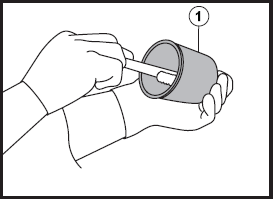 Ø Remove and clean the inside and outside of the air cap with a brush soaked in cleaning solvent. Note: Wash the air cap(1) carefully without causing any damage to its air hole as this would affect the spraying pattern. Never use a steel wire or wire brush for cleaning.If the air hole is clogged, clean it using a wooden toothpick(2). NEVER USE METAL OR OTHER OBJECTS THAT COULD DAMAGE THE HOLES IN THE NOZZLE AND CAP. NEVER IMMERSE THE SPRAY GUN COMPLETELY IN SOLVENT. NEVER USE COMPONENTS OR PARTS THAT ARE NOT MANUFACTURER ORIGINALS. Compressed air is the most common power source, although electric or hydraulic power is also used, with cordless electric devices becoming increasingly popular since the mid-2000s. Impact wrenches are widely used in many industries, such as automotive repair, heavy equipment maintenance, product assembly, major construction projects, and any other instance where a high torque output is needed. For product assembly, a pulse tool is commonly used, as it features a reactionless tightening while reducing the noise levels the regular impacts suffer from. Pulse tools use oil as a medium to transfer the kinetic energy from the hammer into the anvil. This gives a smoother impulse, a slightly lower torque to weight ratio and a possibility to design a shut off mechanism that shuts the tool down when achieving the correct torque. Pulse tools are not referred to as "impact wrenches" as the performance and technology are not the same. Impact wrenches are available in every standard socket wrench drive size, from small ¼" drive tools for small as.sembly and disassembly,up to 3½" and larger square drives for major construction. Impact wrenches are one of the most commonly used air tools. In operation, a rotating mass is accelerated by the motor, storing energy, then suddenly connected to the output shaft (the anvil), creating a high-torque impact. The hammer mechanism is designed such that after delivering the impact, the hammer is again allowed to spin freely, and does not stay locked. With this design, the only reaction force applied to the body of the tool is the motor accelerating the hammer, and thus the operator feels very little torque, even though a very high peak torque is delivered to the socket. (This is similar to a conventional hammer, where the user applies a small, constant force to swing the hammer, which generates a very large impulse when the hammer strikes an object.) The hammer design requires a certain minimum torque before the hammeris allowed to spin separately from the anvil, causing the tool to stop hammering and instead smoothly drive the fastener if only low torque is needed, rapidly installing/removing the fastener. Spray glaze is usually a process before the front of the bathtub, or the interior (that is, the position where you sit). The glaze is used to better adsorb the enamel powder on the surface of the bathtub at high temperatures. The painting is mainly the treatment of the outer surface of the bathtub. Usually sprayed on the outside or bottom of the bathtub. You can see that the interior of the bathtub is white. Because that is caused by enamel. No one will paint in the interior. And if you see other colors on the outside, it is formed by painting. Which spray gun best for glaze sanitaryware? You can use manual spray gun and automatic spray gun, rongpeng has industrial lever spray gun for glaze sanitaryware manufacturers, such as W200 with 2.0-2.5mm paint nozzle, with 60 mesh screen filter and the operating pressure between 2.0-3.5bar.we also have automatic spray gun for your automatic painting work. How to load rongpeng air staplers's staples? open the magazine, and drop the staples in the empty chamber. What about the Rongpeng air stapler? Rongpeng air staplers are built strong for firing into hardwoods. What is the airless sprayer? An airless sprayer is a pump that transfers paint under high pressure (usually around 3300 psi) via a high pressure paint hose (usually about 15m long with UL certificate) to a rongpeng airless spray gun. When the trigger is pulled on the airless spray gun, fluid is released through a small orifice spray tip or nozzle which breaks up fluid into small droplets (atomization) without the use of compressed air. The tip also creates the fan pattern of the atomized spray depending on the size of the tip selected. The airless paint spraying is faster than hand brushing and paint roller, but airless has much less overspray, less bounce back of the paint on the spraying surface. so the airless spray equipment is best use for large area (outdoor and indoor) painting job like a house, roofing, wall, floor, steel structure, waterproofing ,heavy duty industrial, chemial, marine coating and linings,and fireproofing etc. What a roofing nail gun take regular nails? This Roofing nail gun drives nail 19mm (3/4”) to 45mm (1-3/4”), If feature a die-cast aluminum housing and a comfortablehandle for optimal control and comfort, even during extended use.It is well balanced for stability, and ergonomically designed with a longer handle for ease of operation. It also features a hardened driver blade for longerlife, and economical air consumption with low noise. 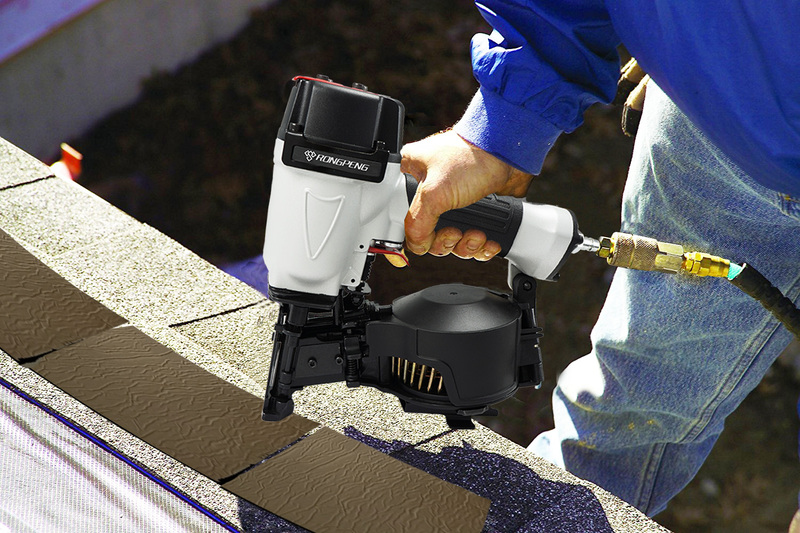 This air powered nailer is specifically designed for professional work. 1. Stay alert. Watch what you are doing and use common sense when operating the tool. Do not use the tool while tired or under the influence of drugs, alcohol, or medication. A moment of inattention while operating the tool increases the risk of injury to persons. 2. Dress properly. Do not wear loose clothing or jewelry. Contain long hair. Keep hair, clothing, and gloves away from moving parts. Loose clothes, jewelry, or long hair increases the risk of injury to persons as a result of being caught in moving parts. 3. Avoid unintentional starting. 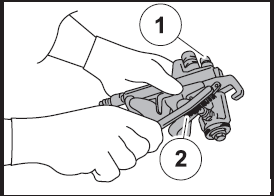 Be sure the switch is off before connecting to the air supply.Do not carry the tool with your finger on the switch or connect the tool to the air supply with the switch on. 4. Remove adjusting keys and wrenches before turning the tool on. A wrench or a key that is left attached to a rotating part of the tool increases the risk of personal injury. 5. Do not overreach. Keep proper footing and balance at all times. Proper footing and balance enables better control of the tool in unexpected situations. 6. Use safety equipment. A dust mask, non-skid safety shoes and a hard hat must be used for the applicable conditions. 7. Always wear eye protection. Wear ANSI-approved safety goggles. 8. Always wear hearing protection when using the tool. Prolonged exposure to high intensity noise is able to cause hearing loss. 9. Risk of Electric Shock. This tool is not provided with an insulated gripping surface. Contact with a ?live? wire will also make exposed metal parts of the tool ?live? and shock the operator. 10. Avoid body contact with grounded surfaces such as pipes, radiators, ranges and refrigerators. There is an increased risk of electric shock if your body is grounded. 11. Explore the workpiece to avoid contact with hidden wiring. Thoroughly investigate the workpiece for possible hidden wiring before performing work. Contact with live wiring will shock the operator. An Rongpeng air drill is a compressed air powered, rotary power tools whose output shaft(shank,arbor or mandrel) is typically fitted with a chuck or taper socket to hold and drive and accessory. Jumbo hammer has higher torque output; twin hammer works with more balanced. The standard twin hammer mechanism impact wrench in rongpeng air tools. The standard jumbo hammer mechanism impact wrench in rongpeng air tools. okay, how about the explanation above, is clear for you to choose the impact wrench between Twin and Jumbo hammer? With a short overview Rongpeng spray gun helpful Hvlp systems tips about HVLP air spray guns. HVLP spray systems are used in the automotive, decorative, marine, architectural coating, furniture finishing, scenic painting, and cosmetic industries. DIY enthusiasts, craftsmen. automobile restorers and fabricators all agree that HVLP guns are great. 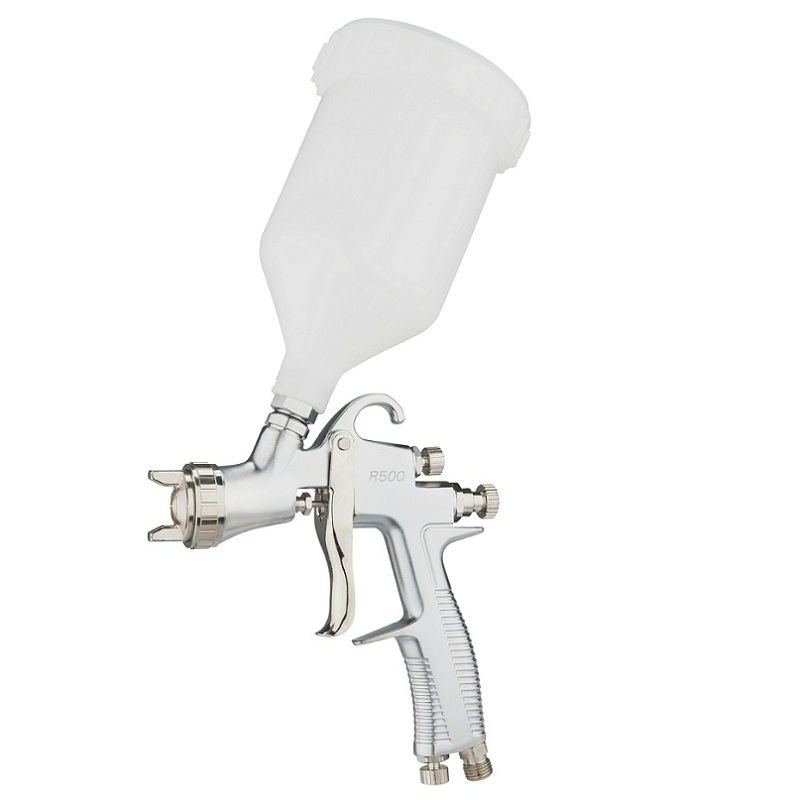 There is a good reason why you will find a spray gun like this in nearly any spray shop on the globe, and below we will be explaining to you why with some helpful Spray Gun Tips. HVLP spray guns can be used by the amateur and professional alike, so this article will explain some pros and cons relating to the technology. This is a short overview of the benefits of HVLP spray guns compared to other technology. 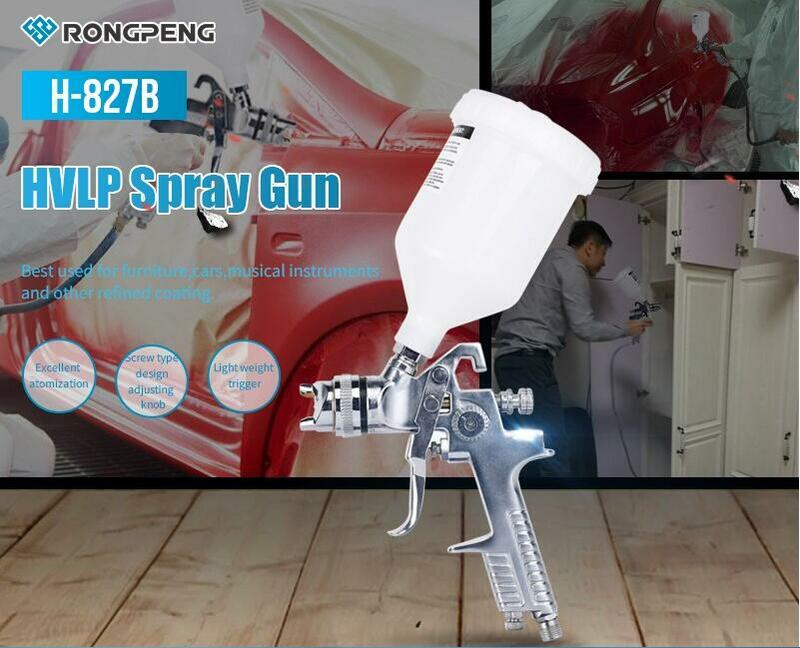 Wholesale, At rongpeng air tools we stand by selling the right spray guns for the painting job, and saves our Importers and brand agents money long term. WHAT IS A High Volume Low Pressure Spray Gun(HVLP SPRAY GUN)? A best hvlp spray gun Gravity Feed HVLP Spray Gun is used in a panel beating workshop. HVLP (high volume low pressure) means a high volume of material is displaced at a low pressure of air flow. This means that more of the paint propelled by the spray gun reaches the surface you are spraying with reduced wastage, overspray, and pollution of the air. · Sprays patterns from 1/4? to 12? HVLP spray guns cover less area than high-pressure types. But HVLP is better in nearly every other way. There is actually just one downside to using HVLP spray guns and that is that they cover less area of effect than high-pressure guns and are slower to use if you are planning to spray large areas. This is due to the combination of high volume and lower pressure used. More material is heavier to displace thus spreading a smaller area. They are considered finishing tools. The most common type will be one that requires a source of air, most of our customers use air compressors for this purpose. The other type is an electrical airless spray gun that creates displacement with a built-in compressor, they are simply referred to as airless spray guns. Most professionals do tend to stick to the spray guns that use an external air compressor due to the benefits it provides. As we konwn if you decide to go with the spray guns that need an air compressor there are some key things you need to understand. air compressor spray gun HVLP spray guns are great that they use less air flow than older guns but they do still need plenty, some people have this misconception that these new HVLP gun only need a tiny DIY compressor… wrong. A rule of thumb puts two thirds of the coating on the substrate and one third in the air. True HVLP guns use 8–20 cfm (13.6–34 m3/h), and an industrial compressor with a minimum of 5 horsepower (3.7 kW) output is required. HVLP spray systems are used in the automotive, decorative, marine, architectural coating, furniture finishing, scenic painting, and cosmetic industries. The reason you still need a large compressor is that of the duty cycle of the compressor. Most air compressors have relatively low duty cycles meaning they cannot run for hours on end unless its a commercial type of machine. You want a compressor to supply enough air that even while you are spraying you are using less air than the pump is supplying, because of this, the compressor will be able to have a rest period in between running cycles. HVLP air flow requirement differ from model to model but they are on the lower end of what spray guns tend to use. This information is referred to as CFM (cubic feet per minute) and you would want to aim for a compressor 25% above the CFM requirement of the gun for most use cases, 40% for commercial applications. · overshoot CFM on the compressor, not the spray gun. · you can spray with a small compressor it will work but you must wait for the machine to refill air pressure and the duty cycle of the machine will be exceeded. · make sure air filters are clean on the air pump and use water traps to keep the air flow clear of imperfections such as water or dust. HVLP is ahead in transfer efficiency. Less paint is wasted in the process and you get further with less paint. Of course, masks should be worn as a precaution but with an HVLP spray gun, the sprayer would be exposed to less dangerous fumes from the paint material due to the high volumes being sprayed. With different kind of touch up spray guns, the HVLP solution can be used for some very sensitive touch up spray work. Professional automotive paint spray guns HVLP Spray Guns are most commonly used when spraying car panels or smaller touch-up jobs. The most popular industry for HVLP spray guns is the Automotive Manufacturing or repairs. You will find them in each body panel workshop on the globe. They are great for spraying most kinds of paints used on cars, on every coat too. The transfer rate and efficiency of the gun give it a very professional looking finish. HVLP has a very broad use case and can be applied to nearly every spray job. The paint container (being either gravity feed or suction feed) is placed under pressure forcing the paint material through the nozzle. A large volume of low pressure area is then intersected with the mainstream causing the atomization process. The atomization process taking place inside the nozzle of the HVLP spray gun. Because of the lowered pressure, the atomized paint has less bounce back. Less overspray, greater transfer efficiency. Illustration of particles and the resulting reduction of a bounceback. Illustration of Adjustments found on most guns. Spray gun painting tips is the quick wear part ,so the nozzle size determines what kind of material can be sprayed by the nozzle spray gun. A larger nozzle size means a thicker heavier material can be used. A typical nozzle set includes the needle, air cap & fluid nozzle. A spray gun nozzle, fluid nozzle, and air cap. Below we will give some information relating to what kind of material is to be used with each nozzle size. Remember this is highly preference based and should only be roughly followed it also depends on the material manufacturers recommendations. Thank you for taking the time to read our first article about HVLP spray guns. We strive to inform our customers with good information in order for them to get the right tool for the job. If you have any questions about HVLP spray guns or anything else please comment below or interact with us on social media. We will likely release more information that is more in depth relating to how to use the guns themselves and get that professional finish. HVLP = High Volume Low Pressure - low spray pressure technology.Terminology for an internationally recognized low-pressure technology whereby the transfer efficiency rate has to exceed 65%, while the maximum air cap pressure is below 0.7 bar. Rongpeng car refinish high performance HVLP spray guns as your professional assistant transfer efficiency rate has to exceed 65%. This is the physical unit used for the measurement of pressure in Asian and Europe. Material and air pressure are indicated in bar (1 bar = approx. 14.5 psi). with 1.3mm for top grade paint for finish coat. Please choose the right one which you needed. Hope you would satisfy with it. This year marks the fifth anniversary of the “Belt and Road Initiative” initiative. As a major innovation in the history of human civilization, in the past five years, the construction of the “Belt and Road” has achieved fruitful results and achieved multi-win. Practice has proved that the “Belt and Road Initiative” has been welcomed by more and more countries. In the past five years, the work of the "Belt and Road" has achieved remarkable results in all aspects, which has effectively promoted China's economic and social development and opening up to the outside world, and enhanced China's international influence and appeal. Regarding the "Belt and Road", there have been many people who have heard of foreign trade partners. Many small partners must not know which countries and regions along the “Belt and Road”. Through this article, Chinese foreign traders come together to understand: What countries are there along the route? First, let's take a look at the distribution map and have a clear outline in mind. In recent years, Chinese pneumatic tools are developed rapidly. More and more businessmen look at the pneumatic tools market. In the past, most products were mainly imported from the United States, Germany and Japan, and most of the products in the hardware market were from Taiwan. And domestic production technology has got continuous progress. Some enterprises in Shanghai, Wenzhou, Taizhou have launched pneumatic tool products. In addition, pneumatic tools are widely used in the assembly industry, machinery industry, transportation industry and skateboard vehicles, electric bicycles, motorcycle assembly, pneumatic repair factories and some enterprises and manufacturers of assembly line work in coastal provinces and cities such as Guangdong, Shanghai, jiangsu and Fujian. First, the operation ability. Pneumatic tools can be done very simply and level of speed range can provide more choice of speed range level through operating the air supply valve handle and adjusting control valve. Under the condition of the same output power, compared with small, lightweight electric tools, pneumatic tools is more suitable for working long hours, without fever phenomenon. Even if the compressed air engine overload phenomenon occurs, the air tool is just stop running. once the overload phenomenon is removed, the tool will become normal. Secondly, in terms of environmental application ability, pneumatic tools have better water resistance. Immersion is harmful to tools, but it is not like a hardware electric tool which can generate electric sparks and cause harm. The pneumatic tool can use the internal combustion engine gas pump and adapt to all kinds of bad or bad environment. Finally, in terms of economic performance, the initial investment of electric tools is low, but the long-term use of energy consumption is high, and the cost of tool maintenance and replacement is high. The initial investment of pneumatic tools requires the establishment of air pressure pipeline equipment, but the long-term use in energy consumption and tool maintenance costs are relatively low. It is reported, in the hardware market competition intense, the variety is various environment, the shop which is engaged in importing pneumatic tool business is increasing day by day, which shows pneumatic tool product has considerable development prospect and superior market environment. Air tools, otherwise known as pneumatic tools are those powered by compressed gas. At RONGPENG we have a wide selection of professional air tools and kits from air drills and screwdrivers to wrenches and chisels. Whatever your air tool needs, we have the product to suit you. All our products are from leading manufacturers including RONGPENG and AEROPRO. Air tools are designed to provide increased productivity, long service life, and safe operation. But, as with any type of tool or machine, these advantages can be realized only through proper application, proper maintenance, and user training. Air tools should be selected by a person who is familiar with air tools and their proper application. Air tool selection must take into account the particular factors in a given job that will affect air tool and operator performance. Some factors to be considered are the workstation design, the operator-tool-task relationship, and the environment in which the user will perform the task. The workstation should be carefully designed so that the workpiece is held securely, so that there is sufficient light and ventilation, and so that means are provided for safely holding or suspending the tool. The workstation should also be arranged for operator convenience and comfort. 4. incorrect air pressure and air flow. To manufacture the many products used in today’s world, industry must receive raw materials, process those materials into parts, assemble the parts into a finished product, and package that product for shipment. The nature of the product, its size, the quantity to be manufactured, and the tolerances specified are a few of the many considerations that affect the selection of tooling to perform these operations. This chapter is designed to help identify the advantages of using air tools in their many applications and to familiarize the reader with the diversified types of air tools available today. Air tools have gained widespread acceptance in industry because of their many inherent advantages. Air motors provide compact, lightweight, smooth-running power sources for air tools. They cannot be harmed by overloading, unlimited reversals, or continuous stalling. Also, they are explosion and shock resistant. Air motors start and stop almost instantly and provide infinitely variable control of torque and speed within their capacity range. Air and hydraulic motors share the advantages of high torque per pound of weight and safe operation in hazardous environments. Air motors also have certain advantages over hydraulic motors. First, air tools do not require return lines, but rather exhaust into the atmosphere. There is no heat buildup when air motors are stalled for a considerable length of time. 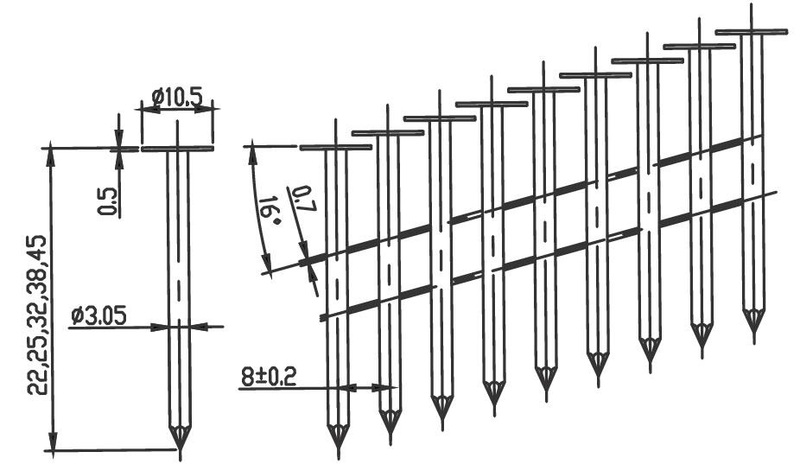 In addition, low-pressure lines of 60 to 125 psig (4.1 to 8.6 bar) are less expensive than high-pressure hydraulic lines of 1500 to 3000 psig (103.5 to 207 bar). Leaks in air systems do not present the safety and housekeeping problems associated with hydraulic leaks. Air motors are unique in their ability to operate at any speed within their range for indefinite periods of time. Even continuous stalling has no ill effects on the motor, since there is no heat buildup and no danger of overloading. All these features contribute to the long service life associated with air tools. In addition, simplicity of construction makes the repair of air tools comparatively easy. in a rotating mass, then delivering it suddenly to the output shaft. with cordless electric devices becoming increasingly popular since the mid-2000s. and technology are not the same. up to 3½" and larger square drives for major construction. Impact wrenches are one of the most commonly used air tools. hammering and instead smoothly drive the fastener if only low torque is needed, rapidly installing/removing the fastener.